…skip ahead a week, and then circle the date exactly 28 days after. Because… by that day… I can declare based on new science, you’re going to have PERFECT blood pressure. Plus, you’ll also enjoy healthier circulation, “younger” arteries, and a strong heart. Just like you had 35 years ago. As a doctor practicing medicine for more than 3 decades, I assure you, this is not a promise I make lightly. However, the brand-new science I’ve verified is clear. …if you use the unusual, “no drugs” secret I’m about to share with you. You’ll have the opportunity to review all the medical evidence in just a moment. …get ready for a big surprise. I’m serious. In less than a minute from now, I’ll reveal this simple secret. And then get your blood pressure checked by your own doctor. I can guarantee you, he’s going to congratulate you on the improvement in your health… and he’ll probably ask what the heck your secret is! There’s a good chance it’s in your kitchen right now. You’re going to find out the answer in less than 30 seconds. My name, again, is Richard Gerhauser. I’ve been a Medical Doctor for more than 30 years and I run a unique practice here in Tucson, Arizona. You see, my clinic specializes in helping American seniors regain their youthful health. I’m also a Fellow of the American College of Sports Medicine. Keeping your body feeling young and brand-new… like you were still in your 30s! We both know how high the stakes are when it comes to keeping your heart healthy. And I understand how scary it can be to hear confusing, conflicting advice on what to do. Which is why I’m excited to talk to you today about a heart health breakthrough that could truly change your future. Imagine… no longer stressing about your blood pressure. is protected and supported, for all your days. This security and blessed peace of mind will all be yours in just a few moments. As I said, the blood pressure secret I’m revealing now might be in your kitchen this minute… or more specifically – in your refrigerator. ...just eating some grapes will NOT get you perfect blood pressure in 28 days. Everyone knows that wine is made from grapes. …live longer and experience better heart health than those who abstain. Until a groundbreaking University of California at Davis study showed the surprising answer. YOU can enjoy perfect blood pressure just 28 days from now. Scientists made a huge breakthrough when they uncovered certain natural chemicals in grapes – called polyphenols. They’re like miniature cell rejuvenators. Like a true “fountain of youth” for your heart and your entire body. To get enough polyphenols to improve your blood pressure in 28 days, you’d have to drink a ton of wine. An impossible (and lethal) amount, in fact. And scientists didn’t know how to separate the polyphenols from the alcohol in wine. However, that’s finally all changed. Because modern science has now developed a way to isolate the blood pressure-improving polyphenols inside. The secret is in a special extract taken from the grape seeds. That way, you skip the alcohol, and instead get the incredible heart health benefits in a highly-concentrated dose! But that’s not going to help your heart. And if you don’t get that exact kind, you’re not getting the right stuff. And it’s so powerful, it is now protected by no less than 4 United States patents (U.S. Patents # 6,544,581 B1, 7,651,707 B2, 7,767,235 B2, and 8,075,929 B2). This premium-quality grape seed extract has been verified in 3 double-blind, placebo-controlled human clinical trials. In one of them, a tiny dose of 150 mg improved blood pressure in 28 days. In fact, the average blood pressure of the participants was just 123/77, at the end. How would you like to get a picture-perfect reading like that? As a doctor, I can assure you, these clinical trials are the gold standard of medical research. Which is why I can now guarantee this premium grape seed extract will help you achieve perfect blood pressure just 28 days from now. But you must use this exact kind – or you won’t be getting the right stuff. And you won’t get the “28 days” guarantee. And I’m making it available directly to American seniors who watched this presentation today. Which is why I’ve chosen it as the superstar ingredient in my new formula called CV Complete. It’s the best solution I’ve ever seen for anyone concerned about maintaining their blood pressure and heart health. And it’s only available directly through this presentation. Beware of imposters selling unauthorized or inferior quality extract. But there’s one more thing. You see… I called it CV Complete for a reason. Number 1 is blood pressure, yes. It’s more than just a number on a chart – perfect blood pressure is vital to reducing stress on your heart and circulatory system. Number 2 is blood flow… making sure your arteries are open and clear so your blood moves freely throughout… without getting sluggish or slow. Number 3 is the health of your arteries… keeping your arterial walls flexible, not stiff and thick. And then there’s number 4. Well, number 4 is interesting because it’s something your doctor very likely has NEVER mentioned to you. It’s actually possible he’s COMPLETELY overlooked it for years. It’s not his fault… almost no doctors talk about it. And it’s a mysterious, silent threat to your heart health. I’ll reveal it in just a minute from now. To give YOU the confidence, security, and peace of mind of knowing that your heart is completely protected. And that it will continue to beat STRONG… for many decades to come. And saves you from the silent threat your doctor is completely ignoring, which I’ll reveal in a moment! First, CV Complete helps improve your blood flow using a molecule so miraculous, it’s been studied by Johns Hopkins, Harvard University, and published in The New England Journal of Medicine. …3 American scientists won the prestigious Nobel Prize for this discovery. …are quietly controlled by a single molecule called nitric oxide. It’s so powerful, the medical journal Science named nitric oxide as Molecule of the Year. In fact, Alfred Nobel himself, father of the Nobel Prize, was introduced to this molecule in a very unusual way. He was prescribed a component of DYNAMITE by his own doctors! It’s true. They advised him to take nitroglycerine, a highly unstable explosive used in dynamite. Now, this was a century ago. Back then, doctors didn’t know why it worked – they just knew that it did. Thanks to modern science, now we know. Nitroglycerine contains something called nitric oxide. And nitric oxide signals your blood to flow like an oxygen-rich, life-saving river! Your eyes, lungs, stomach, limbs… even your own brain and heart fail to get as much life-giving oxygen as they need. Your body is perfectly capable of producing its own nitric oxide. And when you were young, you churned out plenty of the stuff. Unfortunately, nitric oxide levels can plummet 75% from the time you’re a fit, healthy 20-year-old to a 70-to-80-year-old. It could be like turning back time 54 years. Because of this, you’ll experience better BRAINPOWER, stronger MUSCLES, and your energy will SKYROCKET. When life-giving blood flows through your veins, you feel the difference. Your energy keeps pulsing, right through lunch... the afternoon... and far into the evening. Your blood flow will improve EVERYWHERE it counts. Including “south of the equator.” And yes, this is true for BOTH sexes! The fact is, all your organs will get healthier and work better – that’s how better blood flow works. And if this all sounds too good to be true, rest assured – it is proven by real science. To date, over 156,225 research studies have been performed on this award-winning molecule. And with CV Complete, you can now naturally send your nitric oxide up and up… helping to protect your heart, arteries and every organ in your body! CV Complete contains something called Amla. In a legend from the ancient Hindu religion, the gods battled demons in the heavens. During this war, Amla spilled onto earth. They called it the drops of immortality. But the scientists studying it today still refer to it, of course, as Amla. So recently, Amla was put to the test in a double-blind, placebo-controlled human study. Volunteers took 500mg twice per day, for just 12 short weeks. And their nitric oxide levels surged a staggering 54.6%. Scientists already know your nitric oxide levels drop about 10% every decade. Therefore, because Amla can raise them 54.6%... that’s like getting 54 YEARS BACK! The next time you’re out riding your bike or going on a jog… get ready to race right by those 20-somethings in your way! Now, because it can raise nitric oxide to much younger levels, it’s not surprising that Amla has powerful effects on your heart health. Improves markers for inflammation – one of them a full 35.6%! And even lowers your HbA1c level, a crucial marker for blood sugar! That’s why everyone concerned with their heart health, and keeping themselves as biologically young as humanly possible, needs to get their hands on Amla. With it, you can rest easy at night, knowing you’re keeping your heart beating strong for life. Today is the day when that stops being a fantasy… and becomes your new reality. …giving you the nitric oxide boost to increase your muscle strength and sharpen your brain and memory… and so much more. As you learned, complete heart health isn’t just about your blood pressure or blood flow. Think of them like a rubber band. As researchers at the Cedars-Sinai Medical Center discovered, this can make a 30-year difference in the functional age of your arteries. That’s right, just one little mineral can make a 30-year difference in how youthful your arteries are. That’s because this mineral build-up can make your arteries stiff and inflexible. …and your doctor probably has no idea. Your doctor has been advised by governing bodies to not bother checking for this threat to your heart health. First, it might surprise you to know the mineral that makes your artery walls stiff is calcium. Now, before you throw away your calcium pills, or rummage through your fridge and toss every last container of yogurt and vow to never drink milk again… that’s not the solution. Because calcium is actually very important for your health… as long as it ends up in your bones after you ingest it. Calcium can get lodged in your arteries instead. …and you need to stop it. Your body has a natural defense against calcium lodging in your arteries. It protects your arteries. And a groundbreaking, 2-year study on bone health from The Keio University School of Medicine in Japan, proved this vitamin combination grows stronger bones. These weren’t young pups, either. The age-range of volunteers in this study went up to 81 years old! Anyone concerned about long-term, youthful heart health needs both Vitamin K2 and D.
Of course, that’s why I added the full dose – and the highest quality forms of both – in CV Complete. CV Complete is truly the most powerful heart health formula ever created. But it could all be for nothing unless you keep your arteries from a certain invisible threat. You’ve never heard of it until now, because the standard answers for cholesterol and blood pressure are useless against this threat. When your body breaks down the protein in your food, it produces a byproduct. Sort of like car spewing out exhaust fumes after it burns gas. Your body pumps out homocysteine 24 hours per day, 7 days per week. Homocysteine begins breaking down your artery walls. It attacks them… like a rabid animal. And yet, when it creeps too high, and becomes a threat to your arteries… you feel absolutely nothing. SILENTLY EXPLODING out of control. Fortunately, CV Complete has the solution. Harvard scientists discovered high homocysteine comes down to a simple vitamin deficiency. Saving your arteries from the damage. Here’s what the vitamins are: A daily dose of Vitamin B6, Vitamin B12, and folate. Now, don’t worry – you don’t need to scramble to write these down. Or memorize the exact amounts you need. Because the clinical formula of CV Complete contains all 3 vital nutrients. With CV Complete, your heart health will always be completely protected. …where doctor’s appointments and trips to the pharmacy are the last thing you’re concerned about. This can be your future, as long as you have all the vital nutrients your heart’s starving for. And 150 mg of our patented, premium-quality grape seed extract for perfect blood pressure in just 28 days. Because I worked with my team at Solaire Nutraceuticals to combine this complete 8-ingredient formula into a single, convenient capsule. The only way to get my exclusive formula is right here, right now. Please understand, this combination of heart health saviors doesn’t exist anywhere else. Before I created this formula, you could come close to getting it only if you were a patient at my Arizona clinic. …so you can experience better blood flow, blood pressure, and even enhanced brain health and energy! Finally, I pulled a few strings, and made sure to include the patented, premium-quality grape seed extract. Because it delivers you perfect blood pressure FAST. You should be able to see confirmed test results in just 28 days. Get ready to never stress about your heart health again. 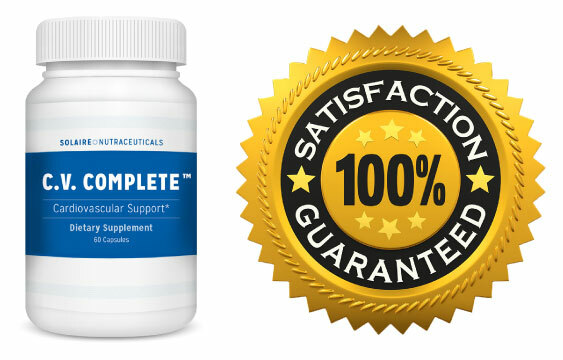 Like all my Solaire Nutraceutical formulas, CV Complete is created in a certified facility right here in the United States. And it’s also non-GMO. Taking CV Complete couldn’t be easier – just 2 tiny capsules per day. When you take it, you’ll be protecting your heart health with EVERY vital nutrient you’ve learned about in this presentation. It’s the exact formula your heart is begging for… so you can stop dwelling and enjoy your life. You can continue along the same path you’re on now, and leave your fate to chance. I’ve seen these kinds of cases hundreds of times. You do not want to take this path. Or you can make the decision to try out CV Complete. …and you won’t have to feel old, stressed and worried! …and deliver exactly what you need for younger, more flexible arteries and stronger blood flow. And nitric oxide like your heart is 54 years younger. You’ll realize you can go back to enjoying your life again, like you’ve always been meaning to. Without worrying about your heart health. Don’t be surprised if a few friends give you a double-take, wondering what’s gotten into you! They may not know, but you will. I’m so confident this formula is going to transform all your important numbers, I want you to try CV Complete with ZERO risk. That’s right… you have an unlimited guarantee when you try CV Complete today. Reserve your own supply of CV Complete today. Follow the instructions and start taking CV Complete daily. Just take CV Complete every day. 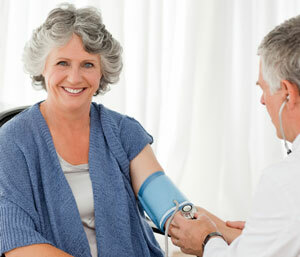 After just one month of regular use, make an appointment to get your blood pressure checked. Then, if for any reason, you aren’t 100% satisfied with your results, simply give us a call or send us an email and we’ll give you back every penny, no questions asked. When the button appears below, click on it with your mouse and fill out your shipping information on the next page. Once you do, we’ll begin packing your shipment of CV Complete and we’ll rush it your way. Carefully packed inside will be your initial supply of CV Complete. …because you won’t have to! As every single day goes by — your heart and arteries will get younger and stronger. And that’s an important question… so I want to make sure your heart health is never without the total protection of CV Complete. …and your blood pressure will start going up. I don’t want that – I want your heart to stay picture-perfect. PERIOD. That means, whenever you’re about to run out of CV Complete, we’ll ship you out a fresh supply and bill the credit card you use today. In addition, you lock in today’s special low price. And today, we’ll even pick up ALL the shipping cost. That’s right… you get FREE shipping on today’s order and all future Priority Pass shipments of CV Complete. Of course, you can cancel or change this program at any time just by calling our friendly, American team. No hassle and complete convenience. That’s how we do business. You take no risk at all. Your satisfaction is ALWAYS guaranteed. It will take you to our secure reservation page, where you can select your initial supply of CV Complete. You’ll also find a way you can save a bunch of money… and get FREE shipping today. For CV Complete and Solaire Nutraceuticals, I’m Dr. Richard Gerhauser. Click the “Add to Cart” button below to get your risk-free supply of CV Complete now.